A big warm hello to all my video programming friends! It’s Andy Gesner and the staff from HIP Video Promo with another clip sure to please. Where were you when you first heard “Tennessee” by Arrested Development? Chances are, you remember – it’s that kind of song. It was, in retrospect, the initial flash of the Southern rap explosion that would transform the genre over the next fifteen years: our first clue that you didn’t have to be from an East Coast inner city or a West Coast automobile exurb to emcee. “Tennessee” felt conscious and positive, yet deeply spiritual; elegantly-written, haunting, mysterious. The song seemed to portend a possible direction for hip-hop that could be abstract, uncompromising, and rich with cultural and historical significance. Here was a track that could – and did – bridge the divide between serious hip-hop heads and fans of alternative rock. In 1992, we were all Arrested Development fanatics. Though there were many voices competing for the listener’s attention on “Tennessee”, there was no doubt that Speech was in gentle but unflagging command. The lead emcee and principal writer in Arrested Development, Speech penned “Tennessee” and a string of hits that shared the strange luster, cutting perceptiveness, and social progressivism of the lead single: “Mr. Wendal”, “People Everyday”, “Ache’n For Acres”, “Fishin’ For Religion”, “Mama’s Always On Stage”. For much of the mid-Nineties, Speech was one of the most formidable R&B and hip-hop hitmakers in America, profoundly influencing the development of both East Coast “conscious” emcees (The Roots) and an entire generation of Southern alt-rap pioneers (OutKast, Goodie Mob, Black Eyed Peas, Nappy Roots). Since then, Speech has continued to allow his conscience to be his guide, releasing critically-acclaimed solo albums and collaborating with fellow travelers such as Neneh Cherry and 1 Giant Leap. Spiritual People, his ambitious, genre-straddling statement of purpose, made Speech a star in Japan, and extended the reach of his already remarkable influence to hundreds of budding Asian emcees. The Vagabond, a compilation of tracks recorded to capitalize on the success of Spiritual People, continues the artist’s deft fusion of hip-hop, hard funk, gorgeous pop-soul, world music, ragga, and acoustic folk. In short, it makes good on the promise of 3 Years, 5 Months & 2 Days in the Life Of Arrested Development: masterful genre-straddling urban music that is simultaneously high-minded and street-edgy. On “Esmerelda”, the standout cut from The Vagabond, Speech does break with one long-standing and unfortunate hip-hop tradition: here’s a rap frontman who has always treated women with consummate respect. Like Aceyalone on “Annalilia”, Speech wraps his elastic voice around the story of an encounter with a girl who steals his heart; it’s playful, amusing and communicative, but it’s serious, too. The beat is gigantic, the hook is ready for radio, and Speech proves again (not that he really had to) that his emcee skills are as formidable as ever. In the clip for “Esmerelda”, a friendly – but somewhat exasperated-looking – Speech sits in the center of a stage set. The camera swings in an arc, sweeping to the right in a wide circle; Speech himself moves with it, crouched in the left half of the frame. To the right, stage extras – racing to keep up with the circling lens – enact lines from the songs. A man dressed as a cellphone keeps catching up with the camera whenever Speech mentions making a call; three video girls (dismissed by the video director) dance in and out of scene. 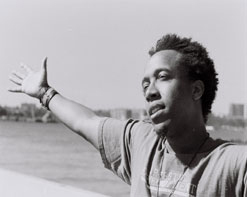 The effect is something like a real-time version of BDP’s legendary clip for “Love’s Gonna Get Ya”: the storyteller in command of his verse, weaving a narrative from people, places, and concepts. Yet where KRS-ONE was supercilious and above-it- all, Speech places himself in the heart of the story, approachable and a little bit humbled by it, grinning and rolling his eyes at the camera as the elements he’s set in motion struggle to keep up with his free-flowing verse. Here at HIP we are very excited to be working with Dan Mackta and the cool folks at bluhammock music to bring you this compelling new video! We will have plenty of copies of The Vagabond for on-air giveaways, so don’t be bashful about getting in touch. Not only will Speech be appearing at SXSW, but he will be on a promo tour in March through the South and Midwest, and he has a string of West Coast tour dates with the Pharcyde’s Tre Hardson scheduled for April. If he is coming through your area, and you would like to set up a video interview or IDs, let us know! If you need more info, call Andy Gesner at 732-613-1779 or e-mail us at HIPVideo@aol.com. You can also visit www.bluhammock.com or www.speechmusic.com to find out more about Speech!